(c) 2008 Chris Baylor licensed to About.com, Inc. When working with mitered corners, particularly when applying trim pieces to a project, even the most meticulously matched mitered corners may open up or separate when installed. This can happen for a number of reasons, the most likely being that the trim pieces are slightly twisted or warped. The project in the above image is a plywood shelf, which is wrapped by segments of mitered 1x2 trim. 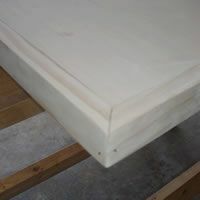 The trim is accurately mitered, but after attaching the trim to the plywood with biscuits, the bottom edge of the mitered corner separated by about 1/16 of an inch. While it's a gap that could easily be caulked in a painted project, this shelf is going to be stained. As such, the gap would stand out like a sore thumb was it caulked. Fortunately, there is a simple solution to this problem using a pair of 4d finish nails; tighten the gap with a pair of clamps and then tacked one finish nail through each trim board into the opposite board. This criss-cross tacking will hold the mitered corner once the clamps are released. Be sure to set the nails using a nail set, then fill the nail holes with wood filler. Tip: If you're staining the project, you may have better success in disguising the wood filler if you stain the piece, then fill the nail holes and then touch up the filler with stain, as opposed to filling the holes and then sanding the filler flush.